The Unseen photography fair, which had its second edition last weekend, is both a throwback and a look forward. It looks forward because invited galleries are asked to show little-known works by known artists, or works by artists who aren't known at all. That's why it is called Unseen, and the selling point is that there really are a great number of good works by artists at the outset of their careers to be seen, compared with others, and perhaps bought. Some of them will be the household names of the future; a canny buyer could shop very well. If you love photographs and trust your judgment even a little, you can find excellent work. There are few pictures above €10,000, and great piles of them in the range below €5,000. Buyers can afford to take chances at Unseen, and so can galleries and artists, with strong sales being reported this year. It's pretty close to how a fair should be - the most exciting in Europe. Some galleries don't play the game, of course. There are some who plug the same stuff they always do, hoping for an easy notch on the sales ledger. One can hardly blame any gallery for playing it safe; it's a hard game. But those galleries who take the Unseen concept at face value and show work that really hasn't much been seen before seem to reap good rewards among the self-consciously adventurous public that attends in Amsterdam. Here, almost at random, are a few things (there were many others) I was glad to see. The distinguished Finnish photographer and video maker Santeri Tuori is hardly unseen. But the Taik Persons Gallery showed works from his Sky series. These could easily be dull; they are just skies. But they are made by superimposing digitally a large number of views one upon another until the skies have a density that is almost lifelike. They are not merely romantic skies - although everybody who sees them says that. They are lovely renderings, thick with rich flavours of air and vapour and light. I liked an elegant view of a junk yard for cars in Wyoming by Ronan Guillou, showing at the NextLevel gallery. This is what Unseen is like: from the sublime to the scrap heap. Viewers needed to be on their toes. Dan Dubowitz showed well last year and was here again. I knew him as an architectural photographer, particularly of ruins. His striking side-on view of a pile of invoices at the Mirko Mayer Gallery was Unseen to me. Aperture showed some simple views by Jason Evans upon which he had physically stuck coloured circular labels; the trick was reminiscent of Walid Raad and a number of others, but still brilliantly effective in keeping the mind engaged in each picture. Some oddly distorted nudes at the Seelevel Gallery by Koen Hauser managed the same thing: black and white figure studies distorted just enough by computer to make each figure a solid art-historical reference to something we knew - Giacometti a bit, Henry Moore and so on. Sascha Weidner (Conrads Gallery) has produced a number of terrifying series, including one of a wood in Japan that people frequent when they're planning to kill themselves. Here a clever study in Kyoto showed a figure hunched in an aluminium survival blanket looking out over the city, as though the whole of Japan were a disaster area. It's hard to draw conclusions from this wild plethora, beyond it being very good for the eye to see so much variety. Few galleries had uniformly excellent displays; fewer had uniformly bad. That's a good sign. The non-specialist British photographic gallery Edel Assanti did very well, showing a number of well-chosen things, not exactly unknown, but certainly brought together from a wide range and with careful enthusiasm. 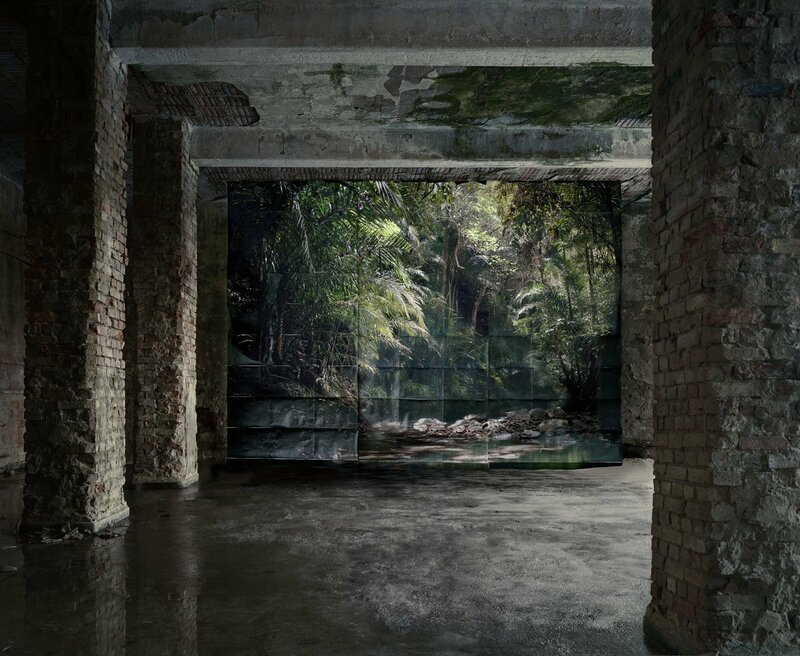 Noemie Goudal is among their artists, showing man-made structures forcibly crammed into the natural environment. Another UK gallery, Michael Hoppen, showed a wonderful series of portraits by Alberto Villar. Unappetising-sounding constructions of compost and worse, they add up to genuinely exciting deconstructed portraits, or portraits of what might happen inside a head. They're not too big, either. At last, we can see that the tide of gigantism which swept photography is receding. Much of this year's edition consisted of apartment-sized pieces: you don't need a white space the size of a factory to own them. You just need an eye, a bit of courage, and a wall.